Last week, I wrote an article titled The Ferguson Effect: Baltimore Millennials’ Worst Nightmare. The Ferguson Effect is a theory where the increased scrutiny of police post 2014 death of Michael Brown in Ferguson, Missouri and Trayvon Martin in Florida will lead to higher crime rates. Baltimore is turning this theory into a reality, as the city descends into chaos before summer start. According to The Baltimore Sun Newspaper, the city has logged in 118 homicides today with the projection of >400 murders for year’s end. It’s so bad here that Baltimore’s Mayor has asked the Federal Government for help in attempt to regain control. Even the police union sounds the alarm of an officer shortage leading to decrease in patrols. All of this is occurring as the Baltimore population declines, nearing a 100-year low, U.S. Census says. The mainstream media dares not to share this with you, because it destroys the gentrification narrative to lure in the millennial generation for city life. Millennials’ are frantically buying real estate <2 miles from this high homicide area. For the sake of the millennials’, let’s hope a spillover in crime does not occur in their neighborhoods. It would be detrimental to home prices. For example, consider how we’ve substituted debt for income. 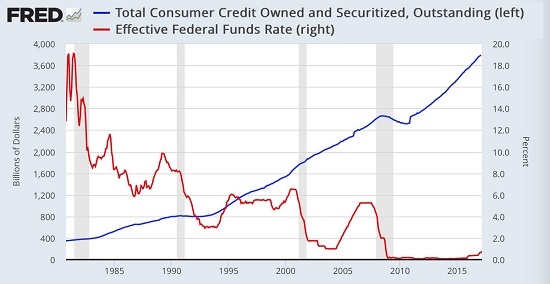 Savings have crashed while consumer debt has soared. This is the core dynamic of debt-serfdom. Was this substitution the result of automation and outsourcing? In Part 2, we’ll look at the politically explosive dynamics that are killing the middle class.